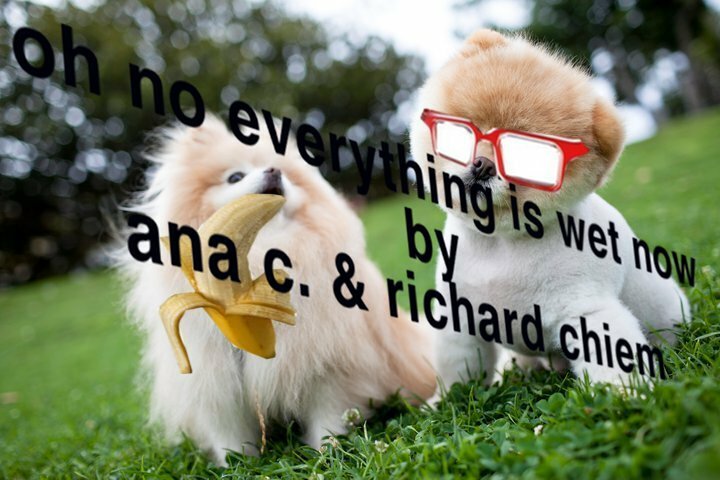 magic helicopter press has published OH NO EVERYTHING IS WET NOW, an e book by Ana C. + me. Much sincere thanks and gratitude to the editor, Mike Young. For the e book, allow for the page to fully load and then simply follow the lines. Or don't follow the lines. Whichever feels better. Thank you sincerely for reading. I saw Ana C. yesterday and we made a public service announcement together re (1) richard chiem/jimmy chen/richard chen/jimmy chiem confusion as seen here through tweets by Mallory Whitten. The PSA can been seen in the previous post. 1 // Frances Dinger performs at the SMALL DOGGIES MAGAZINE READING here. 2 // Eric Beeny reviews WHAT IF, WENDY here. 3 // THUNDERCLAP PRESS published a poem by me here. 4 // JACKET2 interviews with Tao Lin here. 5 // Expanded Literature Part 1: Internet Literature by Mike Kitchell on HTML GIANT here. 6 // A poem by Frank Hinton here. 7 // 287,618 twinkling lights by Dennis Cooper here.